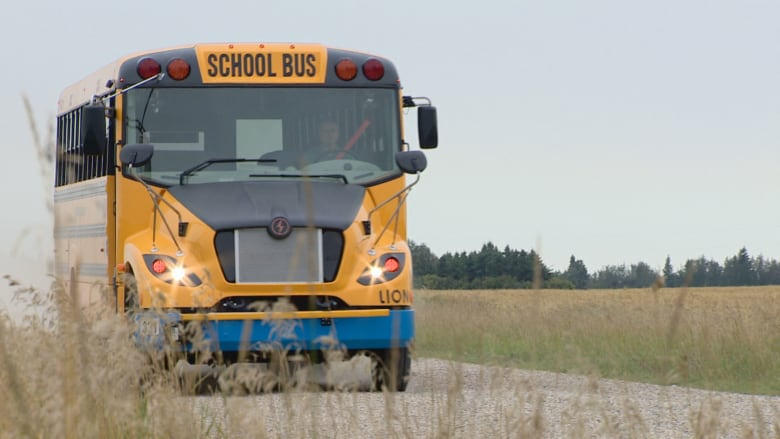 The electric school bus is the first of its kind in Canada outside of Quebec and will do rural routes in the Parkland County area just west of Edmonton. Parkland County students are set to take a ride on the electric school bus on their first day of school Tuesday. The electric school bus is the first of its kind in Western Canada and will do rural routes in the area just west of Edmonton. The school bus looks similar to its diesel counterparts — except that it runs on an electric battery. That battery can last up to 150 kilometres on one charge. Jeremy Kureluk is with Rental Bus Lines, a charter company which operates in Parkland County. He said there is potential for electric buses in Alberta, especially when it comes to reducing emission levels. "You often have a bunch of students being transferred from bus to bus and the amount of emissions that students are being exposed to is quite dramatic," Kureluk said Friday. "If we can reduce that and possibly eliminate that moving forward, I think that could have a very big benefit both as an environmental impact but also as a health benefit for all these students riding these buses." The cost to purchase an electric bus is, on average, $200,000 more than diesel buses, Kureluk said. But he said the operating costs are generally 10 times cheaper than their diesel counterparts. "Provinces like Quebec and Ontario just announced that they are going to be subsidizing the electric school buses," he said. "So moving forward with government subsidies, this is more of a reality people could be moving in towards." Can it work in Alberta's winter weather? One of the biggest concerns with electric buses is their ability to work in colder winter climates like Alberta. The City of Edmonton has tested electric city buses, along with the City of St. Albert. St. Albert has three e-buses currently in use. The bus to be used by Parkland County students hasn't been tested in a full Alberta winter but Kureluk says e-buses have worked in Quebec's winter. This new bus in Alberta will be put to the test this year, but Kureluk expects no problems. "We're expecting it to be toasty warm and to have no issues with that," he said.